S100 Detail Set is safe and gentle on all surfaces. Extra large S100 Motorcycle Detail Swabs and a soft cloth clean well in tight places. 25 eight inch flexible cotton swabs clean between pipes and in crevices. Soft 14" x 14" cloth polishes chrome to a bright shine. 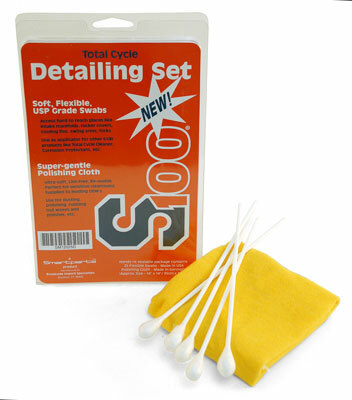 Clean where you've never cleaned before with the S100 Total Motorcycle Detail Set. The large cotton swabs are perfect for cleaning hard-to-reach areas or for removing wax from crevices. The soft polishing cloth can be used for buffing off S100 Carnauba Paste Wax or for general cleaning. The cloth is washable and reusable.